Discus are quite interesting in many aspects, not the least of which are their spawning instincts. Having seen “Finding Nemo”, you will recognize that some of these behaviors were characterized in the movie quite accurately. Now, I know that Nemo was a Clown Fish, and a salt water fish as well, however, there are similarities none the less. First and most interesting is the fact that parent discus care for their young. When first hatched, the young fry are not able to eat anything except a secretion from the parents. This secretion is on the body of the adult discus, so the fry “attach” themselves to the adults for their nourishment. This is the duty of both parents, and they will share the feeding duties 50-50. Within about 5 days, the fry will be able to dine on newly hatched brine shrimp, and at that point they will eat both the parent secretion and the brine shrimp. Parents continue to provide nourishment for up to two weeks after birth. Also interesting is that the adults will watch over the eggs until they are hatched. 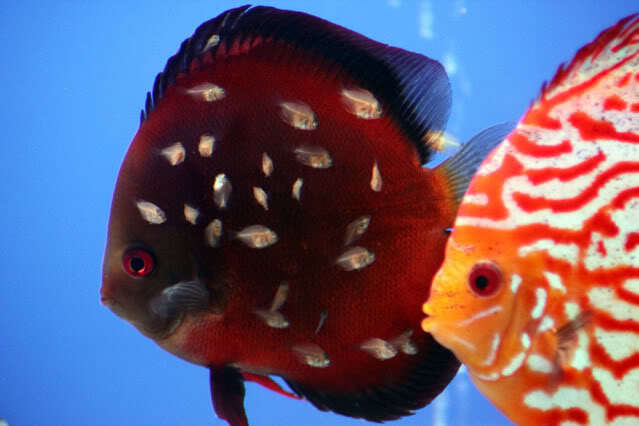 Other adult discus enjoy a nice meal of eggs if they have a chance to get to them, but the parents will ward off other discus to protect their eggs. Pretty cool! In a home tank, the optimal situation is that you raise a group of discus and as the fish mature, they will form couples. These couples will first practice their spawning behavior before actually performing for real. Then the female will produce a small batch of eggs, which the male will fertilize immediately. She will lay several batches of eggs and the male does his thing, while all the time either one or the other of the discus pair will be guarding the brood. They switch off the guard post as their mate is doing their part of the breeding process. Eggs hatch in 2 or 3 days. Now, as already mentioned above, parents continue to have an active part in the care and development of the fry. Even though the discus parents take care of the “personal” parts of the breeding process, the breeder can not be just a causal observer. There are some things to do to ensure successful young discus in your tank. Sometimes your aquarium will have discus that are more dominant than the parental couple, and they may need some “help” fending off the more aggressive adults. If this is the case, it is not a good idea to remove the other discus to another tank. Instead, you should perhaps place a plexiglass divider in the existing tank to keep your new family safe. This is so that the new parents will still think they are carrying out their parental protection duties. It’s a psychological thing in development of fish families. Make sure you keep the tank clean. The new fry are avid eaters, and they will need to be fed more often than the adults, 5 times a day will work. This results in the necessity to change out the water much more often. Consider a 50% water change daily so that the tank stays clean and free of harmful bacteria. 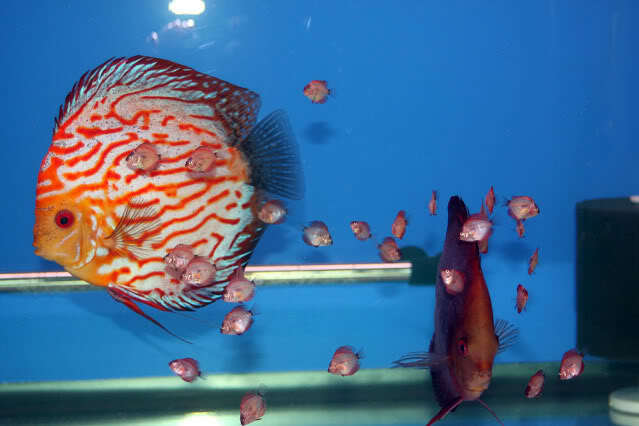 Some breeders move their young discus to a separate tank while they develop. Two reasons – first, they can have a bare bottom environment which is so much easier to “vacuum”, and second, adult discus normally have parasites that do not bother the adults, but they can be fatal to the fry, so a separate tank keeps the young fish free from these harmful parasites. As you can see, breeding discus is not for the “faint of heart”. Consider the commitment and energy necessary before you decide to become a discus fish breeder. If you do take the step, however, you will be rewarded with a very satisfying outcome as you see your new little ones develop and flourish. Below is a video of discus spawning. You will notice that they lay their eggs on a vertical surface. Most breeders provide objects similar to the one in the video. The female takes a pass or two before beginning to lay the eggs. Once she starts laying, the male will come right behind and deposit the sperm. This continues for several passes, and with each one, more eggs are deposited and fertilized.